So here we are in midst of the winter blues, January and February being officially the most depressing months of the year. We enter in reflective mode and the short, dark days certainly don’t help. Let’s talk Hygge, the infamous Scandinavian lifestyle trend. To me, Hygge is all about creating a cosy home environment and I think it’s something we should all embrace, especially at this time of year. 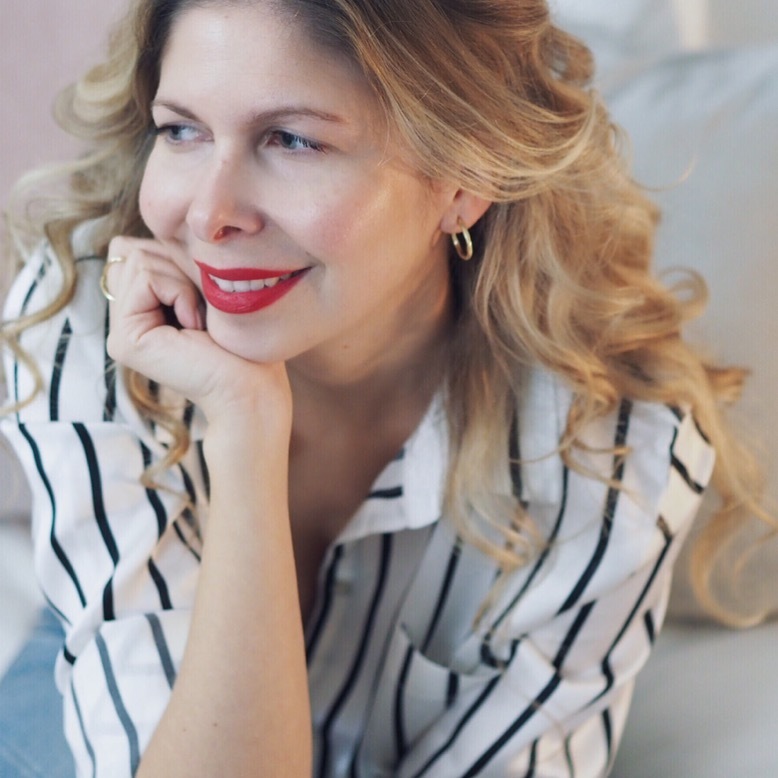 It’s the perfect time to turn our homes into cosy nests , so I thought I’d share a few tips on how to ‘Hygge’ during the winter months. While in the summer we can get away with a clean minimalist look, I feel it becomes all too sterile during the winter months. During this period our home becomes our sanctuary, a place where we find refuge and where we simply want to feel snug. Cosy, soft furnishings and subtle lighting helps to build that place of warmth. I’m a big believer of layers; I’m not just talking wearing lots of jumpers but also when it comes to lighting, as winter is a time when you need to think about creating your own comfort zone. Bring in a sense of tranquillity and depth with lots of different lamps and try to avoid harsh ceiling lighting, and not forgetting the gorgeous winter light that we do sometimes get. Don’t drape your windows with heavy curtains; allow the light to flood the room. I also love to use candles to cast subtle shadows throughout my home; they can provide a dramatic focal point on a fireplace. On the subject of layers, lets of course not forget soft furnishings that play almost a vital part. This is where you can create a look that breathes cosiness. I tend to shop for rugs and throws during this period and pile up cushions of various colours and textures on my sofas. I probably go a bit OTT on the cushion front! When it comes to decorating there really are no rules and it’s all about personal choices and taste, but I do believe there are ways that you can make your home feel a place of warmth and you should enjoy it as much as you can! And lastly but probably the most important point. As mentioned, Hygge is not just about decorating but part of a lifestyle, so invite friends over for dinner and drinks, and enjoy the simple pleasures in life. January blues – we’ve got this! Furniture: Sofa from Flexform; Coffee Table from Dalani.it, similar one here ; Rattan Chair from Cox & Cox; Herringbone Wool Pouf from Cox & Cox; Souk Wool Rug from West Elm; Bookshelf is bespoke. Accessories: Black & White patterned cushion from Ikea; House Doctor Big blush velvet Cushion from Trouva; Cozy Living Small pink cushion from Trouva; Scandinavian Living Grey Linen cushion from Trouva ; Throw on Chair from The Future Kept; Black Ladder from Dwell, Similar one here; Basket from Rose & Grey; Small Marilyn Print from Art & Hue; A4 face print from Bodie & Fou. Kartell Bourgie Lamp from Amara. Big Art Prints above sofa from Desenio. Accessories on Coffee Table: Pink Candle from Rum 21; Wild Rhubarb candle by The White Company; Bahne Black Vanilla scented candle from Trouva; P.F. Neroli & Eucalyptus candle from Trouva; Round Marble Tray Set from Trouva; Bubble Pink Vase by AEO Studio; Hay Pink Tray from Amara; Tile Coasters from Morocco. Oh my word, I adore your living room the perfect place to snuggle down and relax this winter. I agree, theres alot more to Hygge than it first seems. Gorgeous space! I love those bookshelves! More layers please! Great to see the Art & Hue Glamour pop art print (in A4 Red) on display in your wonderful home. Love this post and love your cosy living room. I’d love more cushions but as it is my girls just chuck them all over the floor I’m forever picking them back up and rearranging them on the sofa. All looks so enticing! 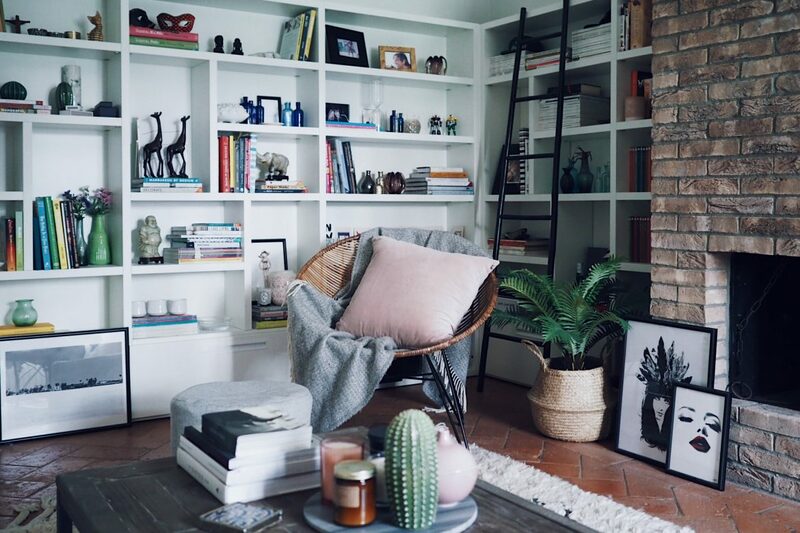 Especially love that wicker chair, I’ve been looking for one just like it. You’re giving us major home envy, Arianna! Lovely post and such interesting ways to Hygge your home. Thanks for featuring so many great Trouva pieces too, I know our independent boutiques will love it!